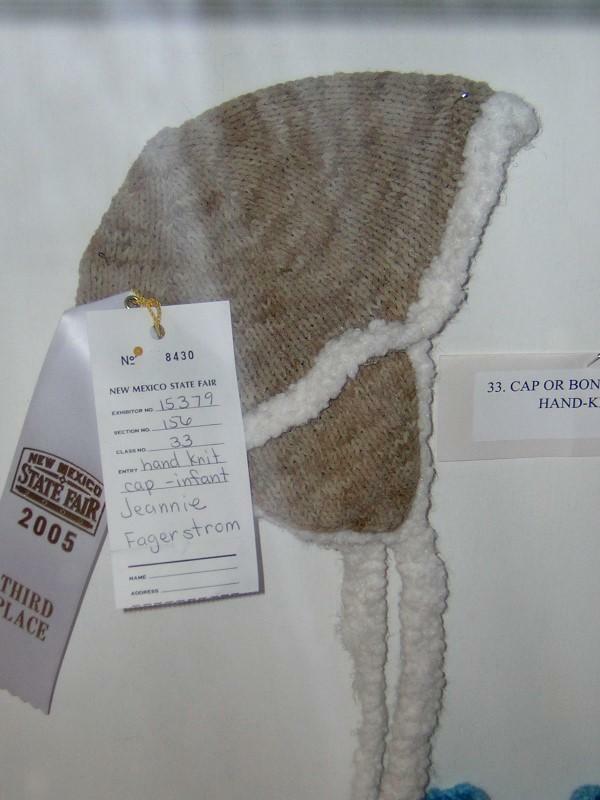 I got my entries back from the State Fair yesterday. Here are pictures courtesy of Noelle. THANK YOU! What great shots. I know you really had to hunt for things as piled up as they were. Meg's baby hat was just down the shelf about 2 or 3 items from my French Market Bag but it was rolled or folded so that if you hadn't seen it before you never be able to spot it on display. 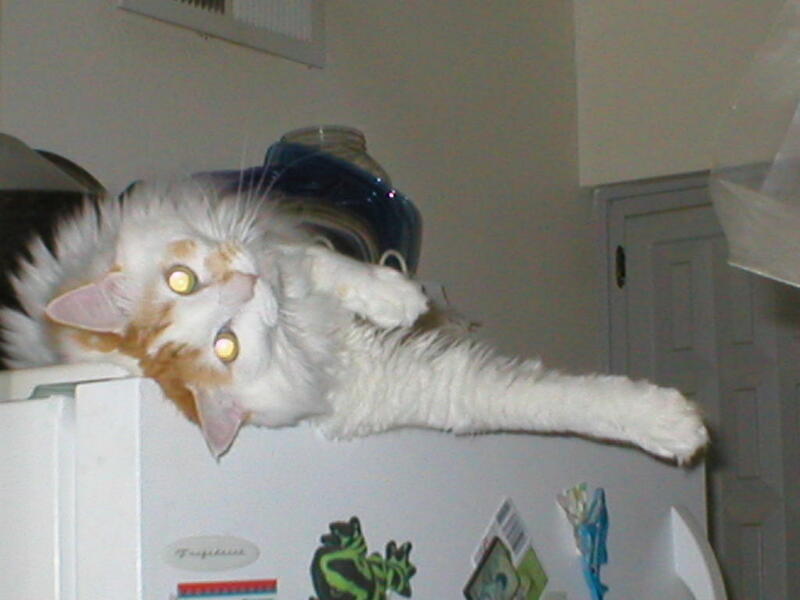 This posting is inspired by The Infinite Cat Project and the new book Hallmarks of Felinity. You guys Rock!!!! I went to the New Mexico State Fair on Sunday. My family and friends rode the Park'n Ride from Coronado Center. Very Simple, very easy. It was $1.00 each way for bus fare, the bus dropped us off at the main entrance gate and picked us up there as well. The addmission fee was $5.00 each for 12 and older. So $7.00 each and no hassle with $5.00 and more car parking on the grounds. We went to the Home Arts building first -of course :). The knitting, crochet, and needlework section was nice. There was a lot to see. 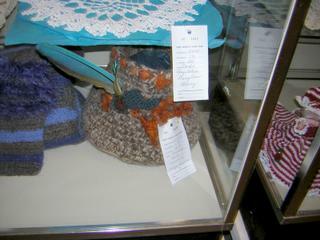 The blue ribbon and best of show things were amazing and displayed in cases by themselves for the most part. Almost everything was beaded in one way or another(the winners that is). 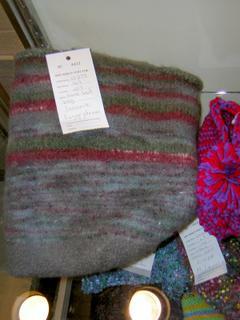 There was a best of show sweater hand knit in bulky Aran pattern -not beaded. 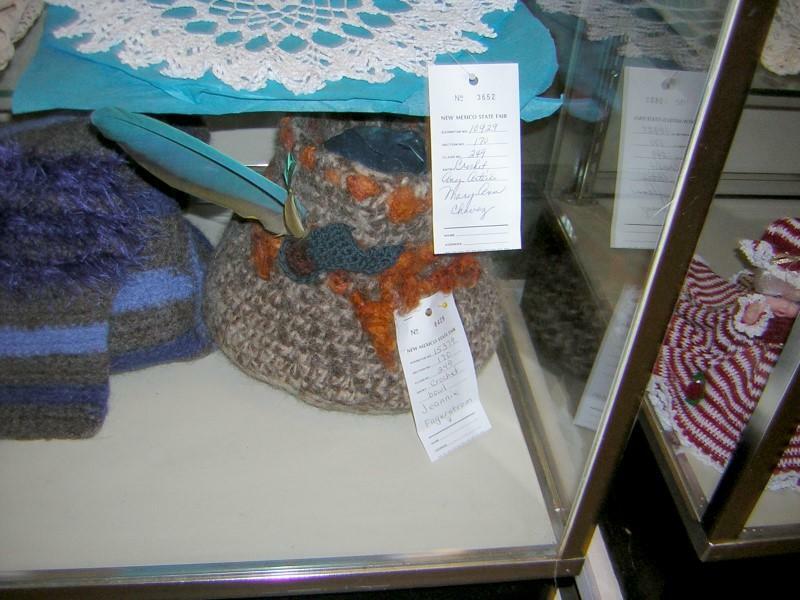 I don't remember what the others things in that case were besides a shawl or scarf that was in lace and very intricate. My French Market bag is folded on a shelf of a display case- you can't really see what it is or how big it is. I think Meg's hat was much better than my little "Hunter" baby hat and Ugg booties. 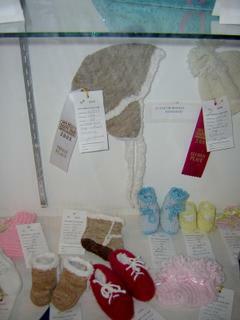 Someone else had a pair of suede booties too, and they won a blue ribbon. They were meticulously made and much tinier than mine. I liked how I trimmed mine better, but the winners definitely deserved the ribbon. The biggest surprise to me was that my "Hunter" hat got a third place ribbon!!! I think it's interesting because the way it's displayed you can't even see the front white trim. Go figure. I don't have a picture of it to show either. I'll get it back on the 23rd or so and post pics after that. I talked to one of the women who helps set up the handwork exhibits and she said it just depends on if there are like items to compare whether or not an item will be considered for a prize. And the things that don't get awarded ribbons or whatever are just put in the cases kind of at random and not displayed as carefully as the top items. I've been SO busy - there's been no time to blog or catch up on my UFO's and FO's. I have plenty of each, let me tell ya. I got three things entered in the State Fair last week. The baby hunter's cap a-la-Red-Green and the "Ugg" baby booties, my felted French Market bag and the crocheted bowl. The class is off to a good start. There were 23 out the 25 who signed up. Wow, I was busy but I got to everyone individually and was able to get most of them going. Next week will be better- I'll be more relaxed, everyone else will be too and we'll have more progress. I'm having them bring in patterns they want to work on and we'll learn the stitches from their patterns if I don't teach them.